This photograph of my father was taken about 1936. At that time he was a Captain and was serving as Assistant PMS (Professor of Military Science) at Arkansas State College in Jonesboro, Arkansas. John L. Lewis was born in Memphis, Tennessee on August 21, 1901. He was graduated from high school in Lake Village, Arkansas and then attended the United States Military Academy where he was graduated in 1925 and commissioned as a 2nd Lt. in the Infantry. About two years later he transferred to the Field Artillery. Following a variety of Field Artillery assignments over the years, he was sent to the Philippines shortly before World War II began. Dad arrived at Manila, P.I. aboard the "Holbrook" on October 23, 1941 and reported for duty at Fort Stotsenberg that night. He had to wait for assignment until November 11, 1941 when he received orders to proceed to the Island of Panay, P.I. on November 18, 1941 taking two U.S. lieutenants with him. Once in Panay, he was to organize the 61st Field Artillery Regiment (Philippine Army) beginning on November 23rd when he would enlist 1,000 Filipinos into the regiment. On November 22, 1941 he wrote to my mother that he had no cooks, no lights, no water - in fact, nothing except a place to sleep. At that time (16 days before the attacks on Pearl Harbor and the Philippines), there were no weapons of any kind for the 61st Field Arty. Regt. (PA) - no field artillery cannons, no rifles and no pistols. Shortly after enlisting the 1,000 Filipinos, Dad wrote that they cut bamboo sticks and used them to represent rifles as they began to train the new recruits. Some time prior to the end of December 1941, they received some Enfield rifles that had been packed in cosmoline since the end of World War I. About December 8th, the 61st Field Artillery Regt. (PA) was moved from Dingle to Cabatuan (a move of about 27 km. by road to the southwest) where they served as reserves for the 61st Division. This unit never did receive any Field Artillery weapons, so they were forced to organize and train as infantry. Unfortunately, the 61st did not receive enough ammunition to permit firing the old rifles before the Japanese attacked them. When the regiment entered combat with the Japanese, most of the Filipino soldiers in the regiment had never fired a rifle in their entire lives. About December 1, 1941, Col. Hiram W. Tarkington was assigned to the 61st Field Arty. Regt. (PA). When he arrived, he became Commanding Officer and Dad became Executive Officer of the regiment. On New Years Eve (December 31, 1941) the 61st Field Arty. Regt. (PA) was ordered to begin moving the next day to the Island on Mindanao. Japanese naval ships were already active in the southern islands of the Philippines, so the move was made first across the Guimaras Strait to Pulapandan, Negros. Friendly forces on Negros provided trucks for movement of the regiment to Dumaguete on the southeast coast of Negros. The final leg of this trip was made on two inter-island steamers during the night of 7-8 January 1942. They arrived at Bugo, Mindanao about daylight on January 8th and began to occupy a beach defensive position on Macajalar Bay which is on the northern coast of Mindanao. A Japanese landing had been made at Davao on the southern coast of Mindanao on December 20, 1941; however, the Japanese force was not large and they were never able to expand their area of control far from Davao. The main Japanese attack on Mindanao began on April 29, 1942 with a major attack on Cotobato. Then the attack on the Macajalar Bay area in the north began on May 3, 1942. That was the day most soldiers of the 61st Field Arty. Regt. fired a rifle for the first time in their lives. It is difficult to imagine how these units were able to sustain any effective combat operations against a well-trained Japanese army under such conditions. Yet they performed remarkably well in defending their positions. 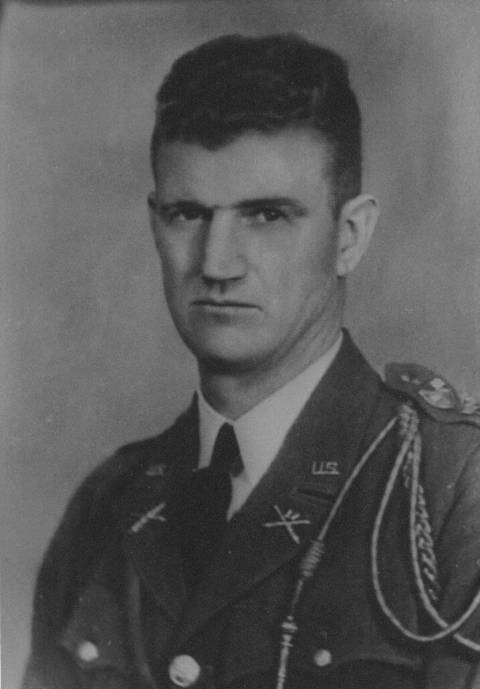 During the evening of May 9, 1942 when it was becoming increasingly difficult to maintain contact with other units and the only communications left was by runner, Col. Tarkington left Dad in charge of the regiment while he went to try to find the Sector Command Post where Col. William F. Dalton was in command. Soon after Col. Tarkington left, the Japanese launched an overwhelming attack on the 61st Field Arty. Regt. positions and Dad was severely wounded. A Filipino runner found Col. Tarkington and reported that "Col. Lewis has been shot through the chest and is dead." After being informed by Col. Dalton that all U.S. Forces on Mindanao would surrender at daylight the next morning (May 10, 1942), Col. Tarkington returned to find that Dad was not dead, but severely wounded, and that the attack had been repulsed. After the war, Col. Tarkington submitted citations for Dad concerning his heroic actions in combat on May 5, 1942 and on May 9, 1942. Subsequently the War Department presented the Silver Star (for the May 5th action) and the Distinguished Service Cross (for the May 9th action) to my mother for my father. The POWs that were captured on Mindanao were consolidated at Camp Casisang, about 5 kilometers southwest of Malaybalay, Mindanao. Note: Most POWs on Mindanao arrived at Malaybalay about May 10, 1942; however, some (especially those near Lake Lanao) did not surrender until later in May. On September 6, 1942 the Generals and Colonels were removed from Camp Casisang and sent to Formosa. Then on October 15, 1942 Camp Casisang was closed. The POWs were taken by truck to Bugo and then by ship (Maru #760) to Lasang Lumber Dock, about 25 miles northeast of Davao. From Lasang, they marched the remaining 15 miles to Davao Penal Colony. POW life at Davao Penal Colony was centered around farming activities. Many of the POWs worked in the Mactan rice fields. Survivors that I have talked with agree that Dad was most likely assigned to the basket-weaving detail where the older and sicker POWs worked. He was one of the older POWs and he was severely wounded the night before the surrender. That detail stayed in the main camp and made the rice straw baskets that are used in harvesting rice and carrying various items. Davao Penal Colony was closed on June 6, 1944 and all remaining POWs (about 1,250 men including Dad) were taken by truck ( blindfolded, tied together and required to remain standing) to Lasang Dock where they were loaded on the Yashu Maru for a voyage to Cebu City. There the POWs were offloaded and marched to Fort San Pedro were they waited for three days before they were loaded on the Singoto Maru for the voyage to Manila. The Singoto Maru arrived at Pier 7, Manila on June 25, 1944 and the POWs were marched to Bilibid Prison. On June 28, 1944 nine hundred POWs from Bilibid Prison (including Dad) were moved to Cabanatuan POW Camp #1. The remainder stayed in Bilibid Prison waiting shipment to Japan. On July 10, 1944 Dad sent a POW card from Cabanatuan (Philippine Military Prison Camp #1). This was the only card from him that was both dated and signed - and it was to be the last communication we ever received from him. In October 1944 the Japanese began moving "able-bodied" POWs from Cabanatuan to Bilibid Prison in preparation for shipment to Japan. Dad was in a group that made this move on October 17, 1944. As U.S. aircraft attacks increased, the POWs had reason to hope that the Japanese would not be able to get any more ships out of Manila. Those hopes were dashed when 1,619 POWs were loaded on the Oryoku Maru on December 13, 1944 and she sailed that night. On the morning of December 14th aircraft from the USS Hornet sighted the convoy including the Oryoku Maru as it sailed northward along the west coast of Bataan Peninsula and began a daylong series of attacks. The POWs were in the cargo holds. The passenger compartments and upper decks were loaded with Japanese women and children plus sailors that had survived sinkings of other ships. The attacks on December 14th were devastating on the Japanese above and caused some casualties to POWs. The Oryoku Maru suffered enough damage on the 14th that during the night the ship limped into Subic Bay and the surviving Japanese passengers were offloaded. On the morning of December 15th, the Hornet's aircraft returned to finish the job they started the previous day. One bomb struck the hatch of the aft cargo hold killing about 250 POWs. Later that morning the surviving POWs were told to evacuate the ship. NOTE: In the fall of 1947, Col. Armand Hopkins, a USMA Classmate of Dad, returned to West Point as a French Professor. This was during my Plebe year at West Point. He invited me to his quarters and told me many details of his time as a POW. He was with Dad throughout the voyage of the Oryoku Maru and the subsequent voyages on the Enoura Maru and the Brazil Maru. He told me that he could not swim and that Dad saved his life by helping him to shore after the POWs had to jump off of the ship. After the POWs got to shore they were moved to a tennis court at the former Olongapo Naval Station where they were held the next five or six days before they were moved by truck to San Fernando, Pampanga. Then on December 24, 1944 all surviving POWs were moved by rail to San Fernando, La Union where they arrived about 2:00 a.m. on Christmas morning. On December 27, 1944 the POWs boarded two ships - about 236 POWs boarded the Brazil Maru and about 1,069 POWs boarded the Enoura Maru. Until recently I had no way of knowing which ship Dad was on for this trip; however, some friends that are excellent researchers provided information that, when combined with information Col. Hopkins told me in 1947, makes it obvious to me that Dad was on the Enoura Maru. These two ships sailed together and arrived in Takao Harbor, Formosa on December 31, 1944. The POWs remained in the cargo holds of these ships until January 6, 1945 when the Japanese consolidated all surviving POWs into the Enoura Maru. On January 9th, aircraft from the USS Hornet sighted the group of ships in Takao Harbor and began attacking them. The Enoura Maru and a tanker about the same size were moored to the same buoy, making them a prime target. During these attacks, the Enoura Maru was severely damaged and one bomb hit the hatch of the forward cargo hold causing the death of about 350 more POWs. For several days the POWs were not even allowed to remove the bodies of their dead comrades. Finally, the dead were removed to a barge and taken to shore. Some reports said that the Japanese cremated the bodies; however, the truth was later confirmed that the bodies were buried in a pit in the sand. After the war, those bodies were exhumed and taken to Hawaii for burial in the Punch Bowl Cemetery. On January 14th the surviving POWs were moved to the Brazil Maru and it left in a convoy for Japan. Temperatures got below freezing. The combination of cold weather, inadequate clothing, injuries and many serious illnesses caused the daily death rate of POWs on the Brazil Maru to increase to as many as 50 POWs per day. On January 25, 1945 Lt. Col. John Llewellyn Lewis became one of those that would not survive this voyage. It would be more than eight months later before his family learned that horrible fate. Late in August 1945 as the USS Missouri sailed toward Tokyo Bay where the unconditional surrender document was to be signed on her decks, long lists of liberated POWs were being read each day on local radio broadcasts back in the United States of America. Our family was one of those listening to each such broadcast as we waited for Dad's name to be announced. We were planning the celebration we would have when he got home and Mother had lined up all of Dad's Birthday, Father's Day and Christmas presents on a table in the living room. The plan was that he would open each present in order beginning with Christmas of 1941and on through his 44th Birthday - August 21, 1945. Then during the early evening of August 31, 1945 all of our hopes and plans burst like a giant bubble when a telegram from the War Department arrived. It began with those words that people learned to dread during the years of World War II -- "The Secretary of War has asked to express his deep regret that your husband, Lt. Col. Lewis, John L. died on the 28th of January 1945..." The date of death was later corrected to January 25, 1945. The emotional impact of that telegram is difficult to describe. Even now (March 2004) it is difficult to write about the details of the indescribably horrible treatment imposed by the Japanese on our loved ones that became POWs and how the Japanese caused so many of their captives to die needlessly. I have not included many specifics that I have learned about such treatment although they weigh heavily on my mind all of the time. As my sister said when Mother died in March 1995, "At last Mom and Dad are together again - this time in Heaven."